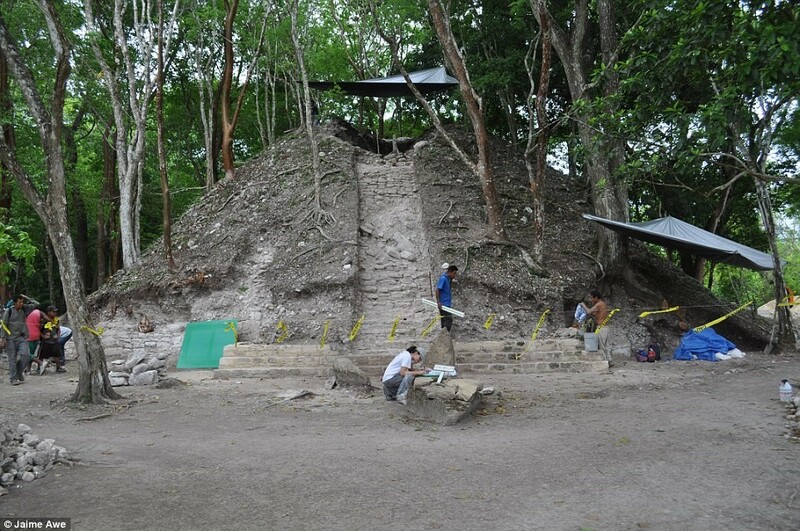 Recent discovery adds to our understanding of ancient Maya civilization. When Europeans set foot on the shores of the New World, one of the most advanced civilizations they encountered was that of the ancient Maya. With a past spanning close to three millennia, the Maya lived in what is now southern Mexico, Guatemala, Belize, and parts of El Salvador and Honduras. Most of their descendants still live in these regions; others are now in areas further north. The history of ancient Maya society is characterized by a multitude of ruling lineages, each controlling relatively small territories centered on their capitals. Unlike the ancient Aztecs, the Maya never had a single ruler controlling the entire Maya territory. During what is known as the Classic period a massive power struggle took place between two major Maya dynasties with Tikal and Calakmul as their respective capitals. When not deploying armies in the field, they employed alliances to encircle their foe. Inscriptions bear witness to these struggles, and to shifting alliances. It is against this backdrop that a recent discovery in Belize needs to be interpreted. Map showing the location of sites mentioned in this blog, among them Xunantunich, Naranjo, Caracol, Tikal and Calakmul. On June 3, 2016 , a tomb was discovered in the ruins of an ancient Maya city called Xunantunich. The site is located in western Belize on the border with Guatemala. The tomb contained the remains of a young man. He was between 20 and 30 years of age, and muscular, judging by the features of his skeleton. He was buried with jade beads, jaguar and deer bones, and fine ceramics. His tomb was beneath the central staircase of a pyramid. Who was he? Nobody knows… Only time and the hard work of archaeologists will tell. However, only feet away from the body, at the base of the same staircase, archaeologists discovered stone panels, engraved with Maya hieroglyphs. Some dusty old Maya glyphs may not sound like much, but these are rewriting Maya history. The tomb was found underneath this pyramid. The blue and green tarpaulins cover carved stone panels. (Image courtesy of Dr. Jaime Awe, NAU). 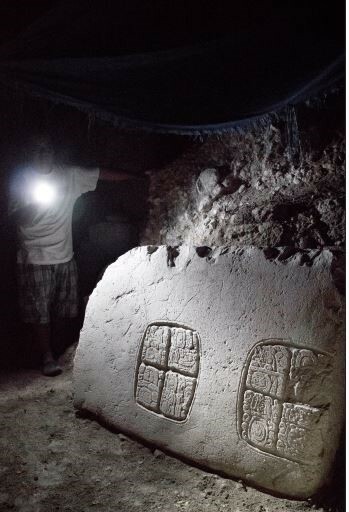 One of the stone panels uncovered during the excavation, called “Panel 3”, is helping to solve a mystery that has intrigued archaeologists for over a hundred years, and is also shedding light on a period of intense competition in lowland Maya history. The panel does not belong at Xunantuncih. When archaeologists translated the text on the panel, they realized that the glyphs were part of a much larger text, originally carved into the steps of a grand staircase located 30 miles away in a city called Caracol. When Naranjo defeated Caracol in 680 A.D., the hieroglyphic stair was dismantled and most of it transported and reassembled at Naranjo. This is not totally unexpected, as portions of that stairway were recovered at Naranjo more than one hundred years ago,and also, more recently, in a city called Ucanal, which lies about halfway between Naranjo and Caracol. What happened? Why are there pieces of this staircase all over the place? The hieroglyphs on the panels of the stair record events that occurred in the period between 623 and 642 AD, during the reign of K’an II, ruler of Caracol. The text refers to Caracol’s victories over Naranjo in 626 and 631 AD. After their defeat, the people of Naranjo became the vassals of Caracol, and paid homage to that city, probably in the form of produce, luxury goods, and labor. They were also no longer allowed to erect monuments of their own. Originally, when the first panels were discovered at Naranjo, it was believed that K’an II had the staircase erected in the middle of Naranjo to spite the inhabitants of the defeated city. But we know that in 680 AD, King K’ahk’ Xiiw Chan Chaahk of Naranjo fought back and defeated Caracol, ending years of oppression, and it is now believed that to celebrate their victory, the people of Naranjo ripped up the staircase that had been erected by K’an II and brought it back to their city as a trophy. Pieces of it probably ended up in Xunantunich and Ucanal because those cities were allies of Naranjo, and were gifted a piece of the winnings. Such was the life of a Maya city in the Classic Period. It’s important to remember that the Maya were not an empire, but a series of city-states, fiercely competing for new territory and access to trade routes. The Maya Classic Period, which ran from about 250 AD to about 950 AD was what some consider the apex of lowland Maya splendor. The majority of the beautiful glyphic texts and some of the greatest Pre-Columbian architectural achievements date to this period. The cities of the lowlands were not the jungle-choked ruins that we see today, they were alive, vibrant, and colorful. Vast areas of forest were cleared for agricultural purposes, and beyond the Maya capitals, with their mountainous temples and palaces, open fields blanketed the countryside, dotted with little hamlets inhabited by farmers. Sharer, Robert J. and Loa P. Traxler, 2006. The Ancient Maya. Stanford University Press, Stanford.